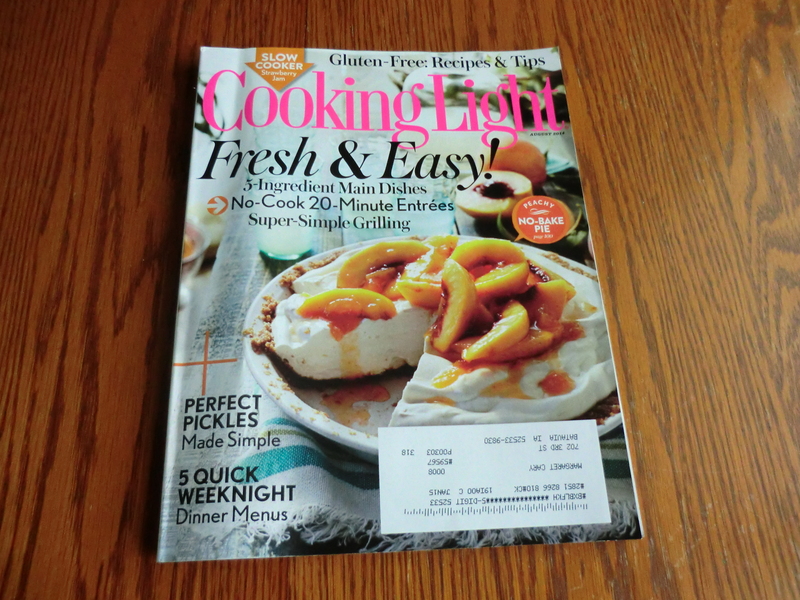 Mom stopped by today and dropped off a “Cooking Light” magazine. She reads cookbooks like I read novels. I get discouraged reading recipes in magazines because they always have one or two weird ingredients. Don’t get me wrong, Mom is the best cook in the county, but I notice she brings the “tried and true” regional recipes to family dinners. She uses the recipes from her mother and mother-in-law the most. Why? Their recipes are made with ingredients found and grown locally. I live in a town with 2 grocery stores and a Wal-Mart. My husband has to do the shopping because of my medical problems and he doesn’t want to go all over town. My home is 640 square feet which meant for years my pantry was in the basement…until I shoved the sheets under the mattresses and started using my linen closet for a pantry. My dry cereal stash is on the shelf in my bedroom closet. I have room for one kind of vinegar, not six. I finally found the reason for the “weird ingredients.” They are ingredients sent to the magazine for the cooks to try. They get free samples and add them to recipes they are familiar with and tada…a new recipe. Scott Mowbray, editor of Cooking Light magazine wrote in his August, 2014 Note from the Editor. “What do maple sugar powder, rare loose teas, tinned white anchovies, obscure jams, Chia seeds, crab salsa, and beer mustard have in common? Answer: All were sent to “Cooking Light” offices for sampling, taken home, filed in my pantry, and never considered again. The fact is, foods we are really interested in get tasted at the office. The rest are orphans, I give a home to orphans. That list was just from the Asian section of his pantry! You will not find one of those items in mine. Thank God for the voice of reason in Mary Hunt at Debt Proof Living. She recommends allrecipes.com and supercook.com. I love allrecipes.com because you type in the ingredients you want to use and they give you a list of recipes using those ingredients together. I thought I would stump them with the ingredients watermelon and cottage cheese. I thought wrong…they had a salad made from those ingredients. Maybe we are burned out on cooking because we are trying too hard. I need to make a list of favorite menus rotate them through once a month. I can always add a new recipe any time. I put it off long enough…I need to go update my food inventory. This entry was posted in Food, Make It, Money Saving Ideas, Purchasing, Use What You Have and tagged Food, Important Things, ingredients, Make It, Use What You Have by Frugal Fish. Bookmark the permalink. I thought I was the only one who didn’t like exotic ingredients! Thanks for commenting.